Why do single op-amp DIP packages have 8 pins, rather than 6? Single op-amps often come in 8-pin DIP packages, with 5 of those pins being standardized (or maybe it's just de-facto) like in the ones below. Older op-amps such as the LM741 (first image) have a very bad sense of what is 0 volts, so they require offset null pins to manually adjust them. Some newer op-amps such as the TL071 are much more accurate, but still make use of extra pins by having this feature, while their dual and quad siblings do not have this feature. Some modern single op-amps have three unused pins, and forego the offset null completely. So why don't many modern single op-amps come in 6-pin DIP packages? They would still conform to the standardized layout, and fit in 8-pin DIP sockets. But they would take up less space in circuits designed for them. 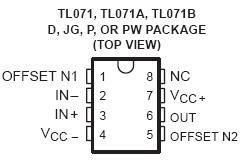 edit: For examples such as TL071, I can that they would put the offset null on it despite it's absence in it's dual and quad siblings so that there's an option for those that do want to adjust it. But even then, many of these are available in different packages, so why not 6-DIP? That still doesn't explain it for the single op-amps that don't have offset null. With nobody actually manufacturing six-pin packages, the first one to do so would have had additional costs that would have been larger than just wasting two pins of an eight-pin package. In other words, creating six-pin DIP packages is just not worth it. There actually are many (opto)isolators that come in six- or even four-pin DIP packages (e.g., 4N25, PC817), but the manufacturing of isolators is somewhat different (typically, LED and phototransistor overlap vertically) and therefore does not allow easy reuse for chips with 'normal' dies. Packages other than DIP are commonly manufactured with fewer pins (e.g., SOT-23-5, SC70-5), so op-amps are also available in those. Single OpAmps come in 5 and 6 pin packages these days. You just won't find them in DIP anymore because most of the industry has moved to SMD packages. It's easier and cheaper to work with them if you're into mass production. There are 6 pin variants as well. These often have extra functionality such as an enable pin, a null-offset trim pin etc. CL is correct - it is a historical legacy - but you need to go back to the initial design and production of op amps in the 1960's to understand why 8 pins. 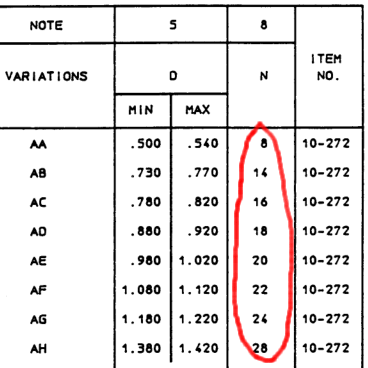 The first op amps required 8 pins to allow for external compensation components, even the 741 required at least 7. Once production lines were set up it was a lot cheaper just to leave the packaging size and pin connections as standard (pin for pin replacement) so that later (superior) op amp designs would be easily substituted in existing (pcb) designs. As Jim Dearden showed, those pins were used for offset adjustment and for frequency compensation (and sometimes to prevent latchup under overdrive). Here is the UA709, with 4 different external C+C+R networks. Notice the bandwidth even at 60dB gain: out to 500KHz. Now for some typical applications. With much respect to Bob Widlar, who started with discrete transistor designs at Ball Aerospace for satellites, he then moving to Fairchild and coercing the fab people to tweak the RTL resistor-transistor-logic process so he could develop the first silicon opamps. Tho AMELCO already sold diffpairs with internal current sources + bias chains, all matching. Not the answer you're looking for? Browse other questions tagged operational-amplifier packages pinout dip or ask your own question. Why aren't components in DIP package shipped with straight pins? Why are 10-pin DIP integrated circuits so uncommon? Why are SMD Diodes different Packages than Resistors and Capacitors? Why can't I swap a TL071 with a 741? Why does an op amp have two offset pins? Why no octagonal IC packages? Why do some voltage reference ICs (LM385B) have 8 pin packages where 6 pins are NC? Do SOIC op-amps packages behave differently from DIP?